Chiropractor Aurora | Did You Know Canada's Food Guide Has Been Updated? Did You Know Canada's Food Guide Has Been Updated? And I am surprisingly pleased with it!! Although I still have a few sticking points. Here is the Good News and the Bad News about the new food guide. 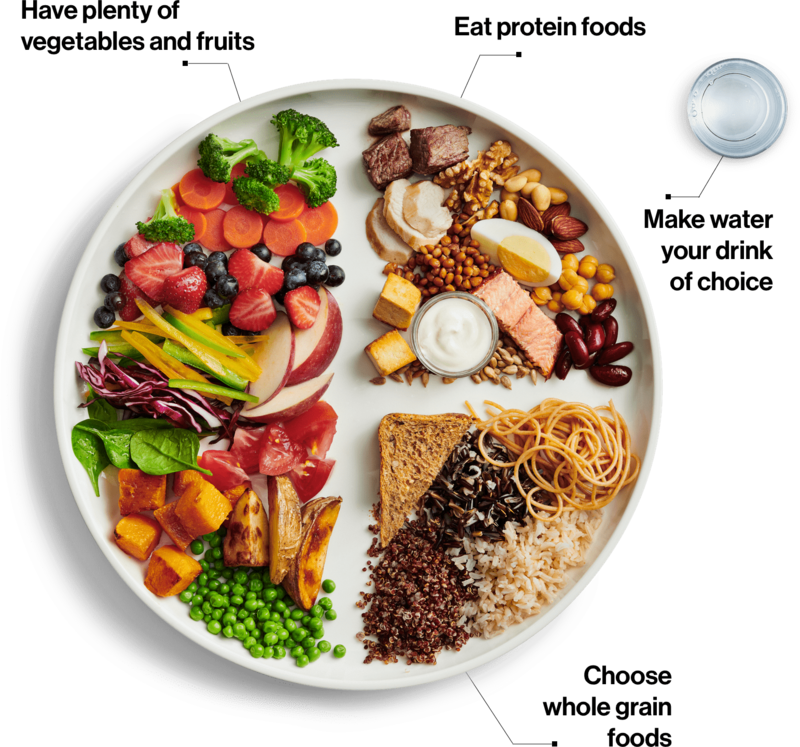 If you look up Canada’s new food guide you will see a beautiful graphic of how your plate should look. It’s really well done and I agree with most of it. It shows a plate half full of vegetables and fruit, a quarter full of quality proteins, and a quarter full of grains. And they are recommending water to drink! I completely agree with this. The only liquid humans require for health is water. The whole milk thing seems to be just gone from the food guide. I love this change by the way. I haven’t had a glass of milk for close to 30 years – and my bones are, miraculously, still very strong! If you followed the new food guide and ate accordingly, I am fairly confident that you would fulfill your body’s nutritional requirements. I think they’ve done a really good job taking a holistic approach to eating. In the eating habits section, they talk about things that have good evidence behind them, that have an important impact on the way we eat, and that truly have an effect on our health and on our nutrition. They talk about being mindful of eating habits. We know that in societies like Japan, they have a saying that one should stop eating when you’re 80 percent full: the more mindful you are, the less likely you are to overeat. They also discuss the importance of cooking more often; when you cook more often you have more control over the food that enters into your body. It discusses “enjoying your food” and “eating meals with others”. I think these are really important principles that are not discussed enough. However, there are still a few ways you could do a much better job fuelling your body. Here are my suggestions to do an even better job fulfilling your body’s nutritional requirements. I would remove the grains section entirely. Humans have no requirement for grains in their diet. These foods tend to be high in calories and low in nutrient delivery. Especially refined grains. But whole grains are also low in the nutrients they provide relative to caloric intake. If you love grains, eat them in moderation with the understanding that they are more of a treat food, rather than a nutritional requirement. There are much better ways to get your nutrients than grains. The grains section could be replaced with healthy fats. The nutritional requirement of healthy fats seems to be largely left out of this updated food guide. In some areas the food guide still vilifies satuated fats. The new emerging research is highly in support of the importance of high quantities of good quality fat as a critical part of our nutritional requirements. Healthy fats like avocado, grass fed butter, coconut oil etc should be staple foods for humans. One definite criticism I have of the new food guide is that their recipes call for unhealthy fats like canola oil and margarine. These products are extremely bad for our health and should be totally avoided. I would have the fruits and vegetables portion be pretty much entirely vegetables. Vegetables are much more nutrient dense than fruits. And fruit is high in fructose which contributes to inflammation and a host of health issues. I don’t mean to bash fruit, but limiting fruit intake and increasing your vegetable intake is going to make you healthier. The science supports it. If you have room for dessert after a meal, this is where I would put in a limited quantity of fruits. If you want a more comprehensive discussion about optimally fulfilling your body’s nutritional requirements, I would recommend you attend our Eat By Design workshop Tuesday February 12th from 6:30-8:00pm at Elevate Chiropractic Centre. You will learn the best fats to eat, how to avoid the worst foods, and how to solve many of your health challenges through nutrition. This one workshop could completely change the way you look at food and fuelling your body for health and vitality. I can’t recommend it enough! If you are interested in learning about how to make healthy eating simple and understandable for you AND your family, then register by clicking here or by chatting with Karen the next time you are in.